Below "will be" a collection of articles covering the HS Boys 2018 WLF Division 1 State Championship and Season. 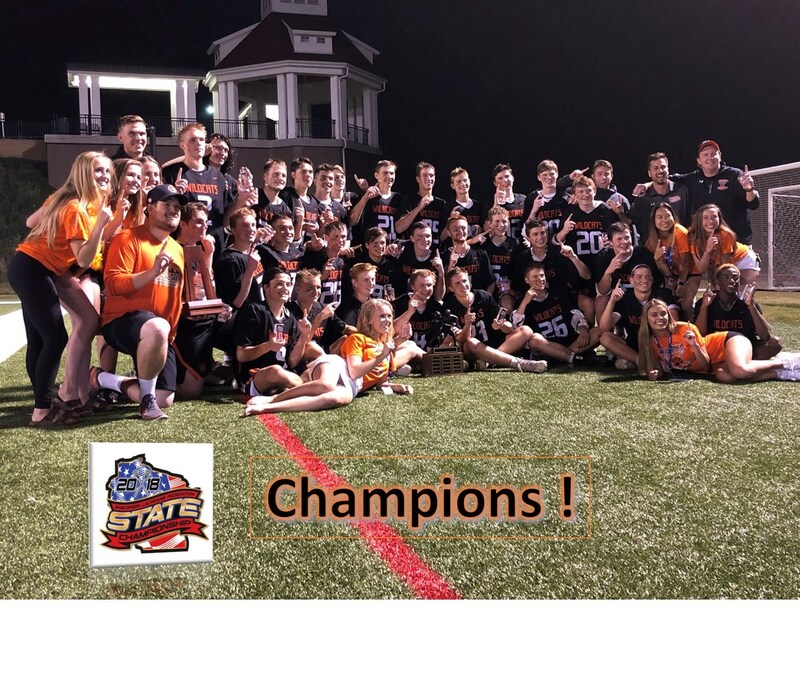 Verona Boys Varsity Lacrosse captures its fifth WLF State Championship, Saturday June 9th at Schneider Stadium on the campus of Carroll University in Waukesha. The Verona boys lacrosse team wasted no time in relishing the opportunity it had to play in this year’s state championship game against Waunakee. Just three days after taking out the top team in the state, Kettle Moraine, in the semifinal round of the playoffs, the Wildcats used a frenetic sense of urgency and a stifling defense to overwhelm Waunakee en route to a 9-4 victory. The win gave the Wildcats their fifth championship in program history out of eight appearances in the final game, and their first title since 2014. There wasn’t much for Verona (13-6) to be negative about Saturday night at Carroll University’s Schneider Stadium in Waukesha. The Wildcats jumped out to a 6-1 lead over Waunakee (19-3) by the 1 minute, 44 second mark in the first quarter. Verona played a press defense that forced countless turnovers by the Warriors, and they won most of the faceoffs, keeping Waunakee on its heels most of the first quarter. Senior attacker Ian Edwards put Verona on the board early on, scoring at 10:07 in the first quart. He assisted on another goal at 9:26 when he found sophomore middie Xavier Howard with a dish. After Waunakee got on the board, Verona started a 4-0 run led by two goals from sophomore middie Haakon Anderson to take a 6-1 lead. The Warriors – who defeated Verona twice during the regular season – wouldn’t get within four goals the rest of the game. Lutterman credits Verona assistant coach Sam Prete, the team’s defensive coordinator. The Badgerland Conference’s assistant coach of the year developed the game plan that saw the Wildcats hold their final four opponents to six goals or less. “We saw today exactly the job he did when he came up with what he wanted to do with that Waunakee offense,” Lutterman said. Along with the stellar defense, Edwards credits a moment of clarity for him and his teammates after the loss to Sauk Prairie in the Badgerland Conference tournament for the Verona championship run. He said the Wildcats had fallen victim to “heroball,” where every player tried to take things into their own hands when things aren’t going right for Verona. After the conference tournament, the Wildcats began playing as a team instead. Despite the loss, Waunakee can celebrate a successful year as well as a solid foundation for the future of the program. The Verona boys lacrosse team led from start to finish in every one of its playoff games, including Saturday’s state championship. Verona tallied six goals in the first quarter on its way to the program’s fifth lacrosse state championship in eight appearances and first since 2014. The Wildcats were ranked fourth in the state but knocked off top-ranked conference rival Waunakee 9-4 at Carroll College in Waukesha in the final. Verona lost its first game of the regular season at Waunakee and then again by the same 12-8 score May 15. Verona’s other four losses came to Kettle Moraine – a loss the team avenged June 6 to reach the state tournament – Arrowhead, Middleton and Sauk Prairie. Verona rattled off four straight wins after the May 21 loss on the road against Sauk Prairie, 14-13, en route to its state title. From that point, on any misstep meant the team’s season would end, but the team had a couple of four-year varsity their teammates could lean on. Ian Edwards and Graham Sticha were both around for one-goal playoff losses at home the last three years, and they weren’t going to allow their careers end on a similar note, Lutterman said. As a result, Verona never trailed in the playoffs. Junior Graham Jeske and Edwards each scored twice and set up another goal, and sophomore Haakon Anderson chipped in two more goals Saturday to help Verona enter halftime with an 8-2 lead. Putting Waunakee on its heels early allowed Verona’s defense to play very aggressively. The Wildcats also knew that with Waunakee having a freshman goalie in his first state championship game, they couldn’t allow him to build confidence early. Sticha added a goal and an assist, and senior Jake Doerfler and junior Maxx Kaminski each added a goal to keep the pressure on for Verona. Sophomore Xavier Howard also had an assist. Senior goaltender Ethan Maurisek stopped four of the eight shots he faced. Verona also won titles in 2004, 2005, 2011 and 2014 and finished runner-up in 2003, 2010 and 2013. Although it was his first title as a coach, it was Lutterman’s fourth overall, as he was a player on Verona’s 2004 and 2005 teams and an assistant coach on the 2014 team. Jeske scored four goals and set up another Wednesday, May 6 to help Verona advance back to the state title game with a 12-6 victory at Kettle Moraine. Edwards added three goals and assisted on three more in the win, and Sticha (1G, 2A) also had multiple points. Sophomores Sam Wood, Ollie Gauthier and Anderson each added a goal. Sutter won 12 of 21 faceoffs and had five ground balls, which tied Edwards for the team lead. Maurisek had five saves to earn the win. Ian Edwards doesn’t get nervous anymore. Not before games, at least. Not when he’s played more games than anybody else in the history of the Verona boys lacrosse program. Last week, however, was different. Edwards already had left his mark in the school’s record book. After four years, he ranks first with 220 goals and almost 300 points. But he wanted to close his high school career with a state championship. Mission accomplished. For the fifth time in the program’s history, Verona (13-6) won the Wisconsin Lacrosse Federation state championship with a 9-4 victory over Waunakee (19-3) last Saturday at Schneider Stadium in Waukesha. Verona entered the tournament unseeded and struggling. The Wildcats lost to Sauk Prairie in the semifinal round of their conference tournament — a game Verona felt it could have won, Edwards said. But to Verona coach Nathan Lutterman, that loss served as a wakeup call. “(After that loss), our offense never played faster, never played harder than the last week-and-a-half of our season,” Lutterman said. And the coach said it was that intensity that carried the Wildcats over three of the top four teams in the state rankings as they carved a swath through the state tournament bracket, including a victory over top-ranked Kettle Moraine in a semifinal. The Wildcats held each opponent to six or fewer goals — something Lutterman said was a consequence of going up against the revitalized offense at every practice. “The level of intensity that our offense was able to bring in practice (was able) to really push and challenge those guys” he said. “They did a great job of running scout offenses for us. Waunakee coach Michael Reiter said his team gave its best effort. Verona got off to a quick start with a goal from Edwards at 10 minutes, 7 seconds of the first quarter, and his assist less than a minute later made it 2-0. Following a goal from Waunakee, Verona went on a four-goal run to go up 6-1. For his efforts this past season, Edwards earned a second All-American honor and will play next school year at the University of Indianapolis, an NCAA Division II program. His teammate, defenseman Declan Makuch, will play at NCAA Division I Canisius College in Buffalo, New York. Edwards said his past two seasons, in particular, were especially meaningful. “Out of all the personal accolades I’ve received, nothing means more than being their captain for two years,” the senior said of his teammates. And the cycle continues: On Monday, two days after the championship game, several underclassmen had to miss the Wildcats’ end-of-season banquet because of a practice session with their club program.